That’s a Decoview security screen door. Get in the swing of things with Decoview hinged decorative security screen doors. You can have the latest stylish laser cut screen design to compliment your house and make an impression. With a beautiful architecturally styled contoured frame and high quality locks and hinges, Decoview doors not only look fantastic, they are made to withstand break-in attacks and the worse the elements can throw at them. Keep your property secure while looking stylish, not like a steel cage. Not only do Decoview look good, they have been made to exceed the Australian AS5039-2008 standards. Keep bugs out by let the breeze in, Decoview doors are fitted with fly screen mesh. Made in Australia, better quality, more local jobs. Industry leading & corrosion resistant through clever manufacturing process. Decoview decorative security screen doors are the latest in security and barrier screens. We have combined fantastic laser cut screens and CNC perforated screens with the best component. Similar to any conventional security door, including fly screen, our doors will fit exactly in your space but look so much better! 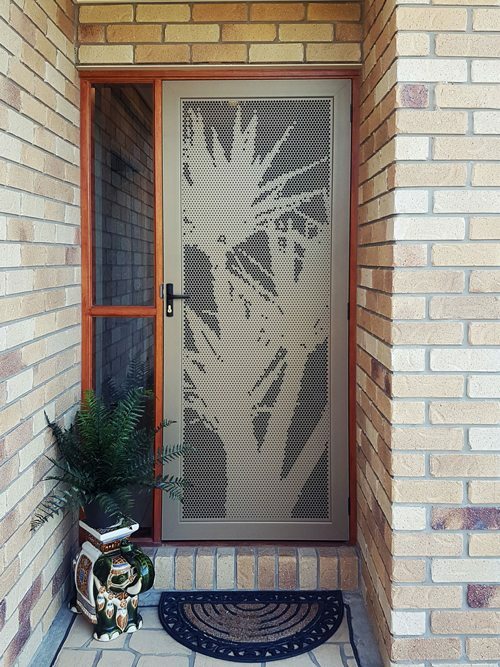 Decoview screens come in two main material pattern types: laser cut designs which serve as barrier doors with some designs appropriate for security doors, and CNC punched perforated aluminium, which is suitable for high security applications and anti climb scenarios. 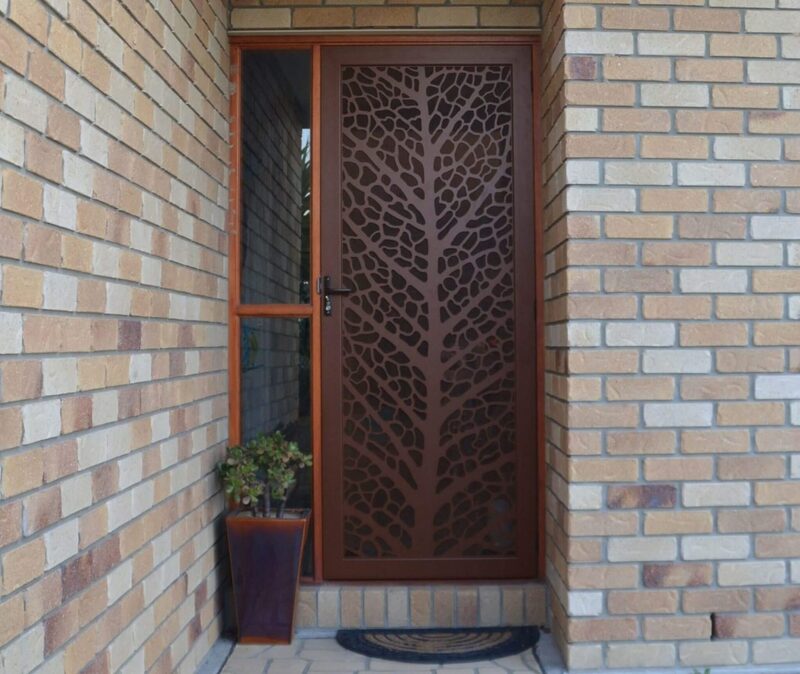 Decoview laser cut doors are the most incredibly beautiful and creative decorative screen doors on the planet. 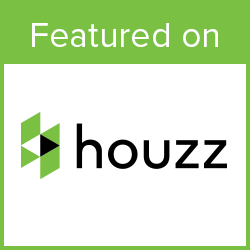 You have almost endless design possibilities, which means you get so much more than just a security screen door. You have a work of art combined with the functionality and benefits of a high security door. Laser cut Decoview doors come in 3mm aluminium and can be made thicker if required for added strength. We have an extensive range offering varying levels of security. We would be happy to discuss and recommend one of our door designs to meet your particular needs. If you have a specific requirement or specification that needs to be met, please talk with us to see how our laser cut security screen doors can be used on your project. Some designs are stronger than others and only certain doors that have a smaller than 70 mm opening can be truly classed as a security door. One thing is for sure they look fantastic. Decoview Perforated Security Doors provide our highest level of security. I can see you but you can’t see me. Imagine being able to have free flowing air, security and privacy. Decoview perforated patterns give an extra element of privacy and security. They are our strongest doors made of a single sheet of perforated Aluminium. Decoview decorative security screen doors are made from the finest materials. You cant set out to make one of the world finest laser cut decorative screen doors by making compromises. Our Decoview extrusion frame is made from high quality 6063 T6 Aluminium. 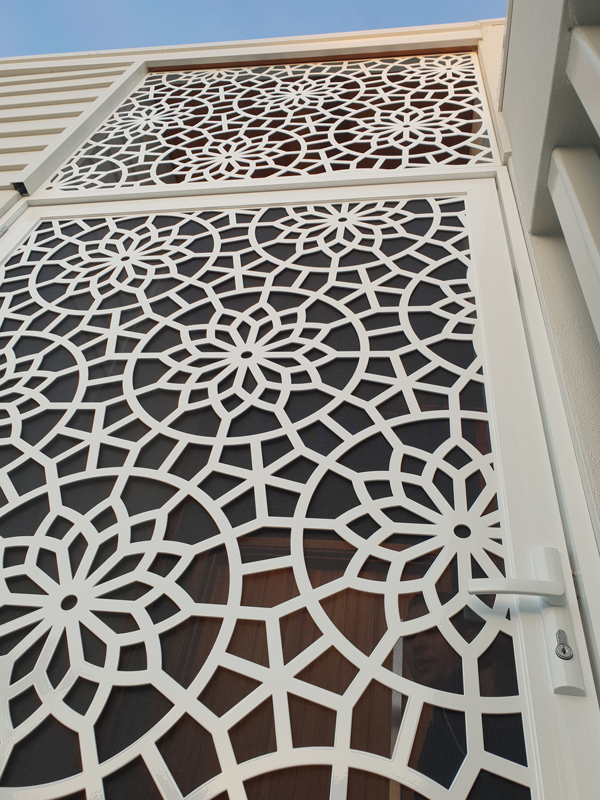 Our laser cut screens are cut from 3mm thick 5052 or 5251 Aluminium marine grade sheet. Our perforated panels are punched from 2mm thick 5052 or 5251 Aluminium marine grade sheet. 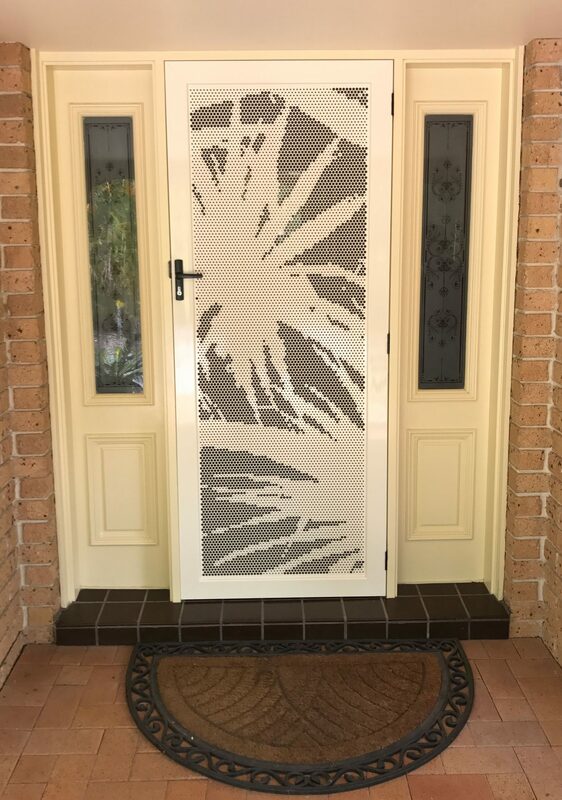 Decoview decorative security screen doors are made to measure and can accommodate laser cut screen sizes up to 1490 x 2990mm. Just supply us with the measurements and Decoview can provide an estimate on your stunning new decorative security screen door and/or windows. We manufacturer our screen doors and windows in Australia and Ship Worldwide! That means we make Decoview screens to your exact specifications. If you require an odd sized or over-sized door, or just want to replace an existing door or window, be assured that our Decoview screens are made to suit your needs perfectly. Not only are our Decoview door frames made to measure, but our screen panels are laser cut or punched especially for you. Choose a standard design, or alternatively we can custom design a laser cut screen to meet your special needs. Decorative security screen doors don’t work without hardware, so why not use some of the Industry leading products. 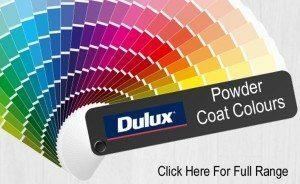 There is a world of powder coated colours to choose from! We don’t just restrict you to 10 boring shades of beige and black. Why not make a statement! Please leave your details so we can work out the best price for your new Decoview security screen.As every screen is made to measure, the more information we have, the more accurate a price we can provide. Discounts also apply for multiple screen orders. Choose your design. We have similar designs in our laser cut and CNC punched range.